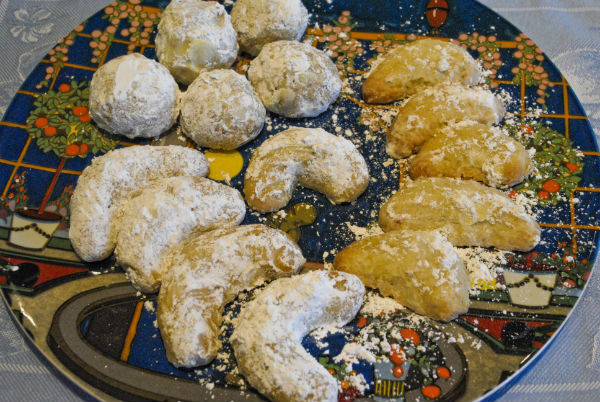 Courabies, Kourabiedes, Kurabiyes, is a rich nut cookie adopted by the Sephardim from the Greeks. It is made with almonds or walnuts, then rolled in powdered sugar, and served with Turkish coffee or tea. My great auntie, Amelia Touriel Notrica, my paternal Grandmother’s sister, always served a parave (non dairy) version after dinner with tea and fruit to finish the meal. Auntie Notrica was born on the Island of Rhodes, Greece. She lived a long, vivid, prolific life until September, 2000 when she died at 103. She was an icon of the Rhodosli community here in Los Angeles. When I began this story I researched several sources for recipes, including but not limited to the cookbook from her temple, Cooking The Sephardic Way, where the cookies are referred to as Curabiye and the recipe is parave or non dairy. Next I went onto a Greek cooking blog called Kalofagas , where the cookie is spelled Kurabiede and made with butter. I continued my search and found many recipes on line when I googled Kurabiye or Kurabiede including one on the web site Cooks, which I tried. This recipe contained both butter and oil. The cookies from the ‘Cooking the Sephardic Way’ cookbook baked up, dense, crisp, distinctly almond, and best of all are non dairy and very simple requiring no mixer. I replaced the walnuts called for in the recipe with almonds, and followed the version that called for eggs. With the Kalofagas’ Kurabiedes recipe, containing butter and baking powder, I omitted the brandy and used fresh orange juice. The result was a very rich delicate cookie with buttery,clear almond taste. 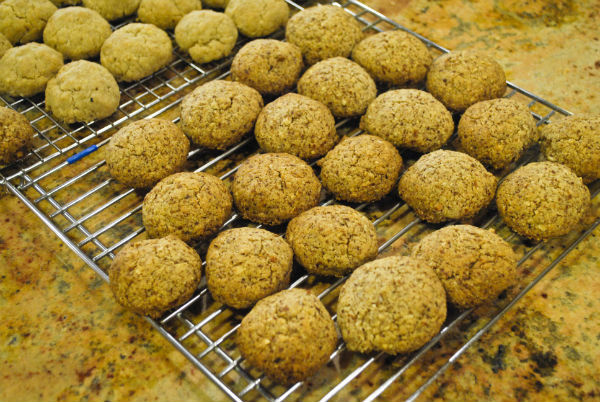 This recipe makes a large quantity of cookies, between 80 to 120 depending on the size you choose. 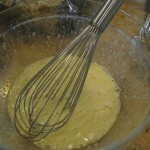 In the third recipe, I used an extremely short (rich) mix of butter and oil from the Cooks blog. Delicious, but almost too buttery. 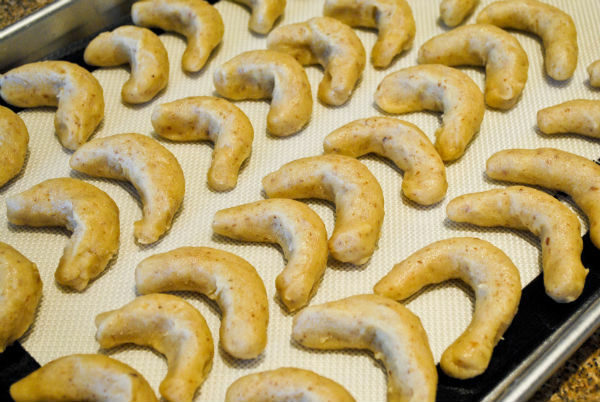 The Kurabiedes spread loosing their crescent shape and the edges were more characteristic of a thin butter cookie, with a little more gold color and crisp. The problem is, a butter cookie, while melt in your mouth and tasty, is not that versatile in a kosher home. 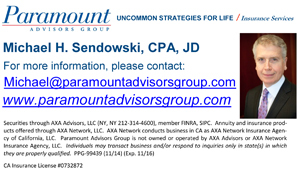 Next step was to innovate on my own. I thought how about a gluten free version with almond flour and how about a flour version with walnuts? Maybe I will add some Raki or Ouzo instead of the orange juice for the liquid. Recipe #1, Walnut and flour base, parave, no butter, easy to make. This cookie came out with a nutty, rich, satisfying taste, including a subtle hint of spice. Recipe #2 Kurabiye, dairy free, gluten free, kosher for Passover (use kosher for Passover powdered sugar) or all year round, no mixer required. .A fabulous cookie; with chewy inside, crisp outside, offering a subtle blend of flavors with overall almond satisfaction. I passed a few around to a beauty salon owner, manicurist, caregiver, a friend, Nona, my husband, my kids, everyone agreed, unbelievably good. Lastly, I think all of these recipes are keepers, but for overall versatility and taste I would make the gluten free number 2 cookie with almonds. 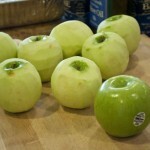 Make them and store them in an airtight container with a good lid. They keep well. 1 package of powdered or confection sugar. 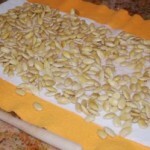 Roast a package of almonds in a 350° oven for about 10 minutes. Place some almonds in the bowl of a mini processor. Measure one cup of almonds after you process them. Almond flour is available in specialty food stores. 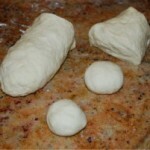 Place all the ingredients except the powdered sugar, in a mixing bowl and mix the dough with your hands or a wood spoon. Knead the dough with your hands for a minute. Break off small walnut size balls with your fingers. Roll each ball until smooth. 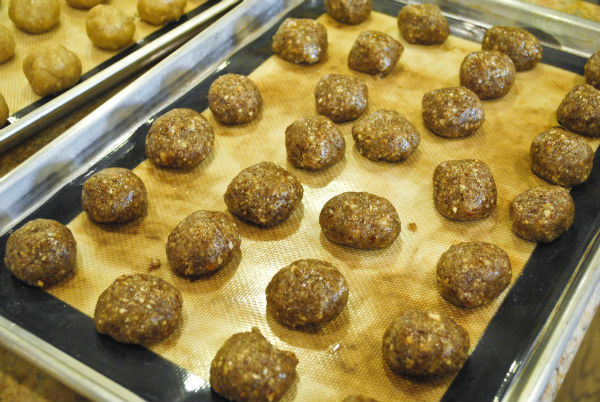 Place the little balls on a silpat or parchment lined baking sheet, evenly spaced. Bake the Kurabiyes in a preheated 350° for 15 to 20 minutes or until just beginning to color, kind of blond with a little gold. Remove the Kurabiyes from the oven. Pour the powdered sugar onto a cold baking pan with sides. Let the Kurabiyes cool for a couple of minutes until you can touch them without burning your hands, but still warm. 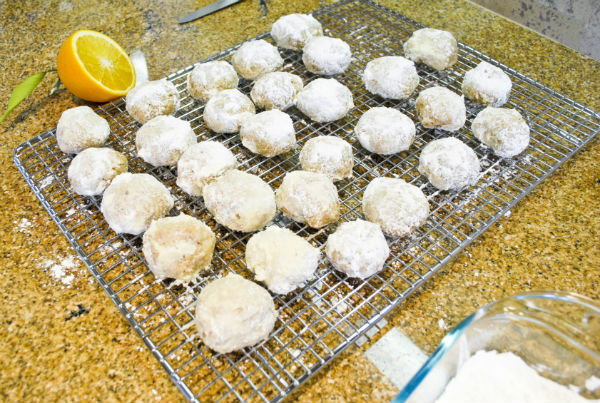 Roll each cookie in the powdered sugar while still warm and set on a rack to finish cooling. 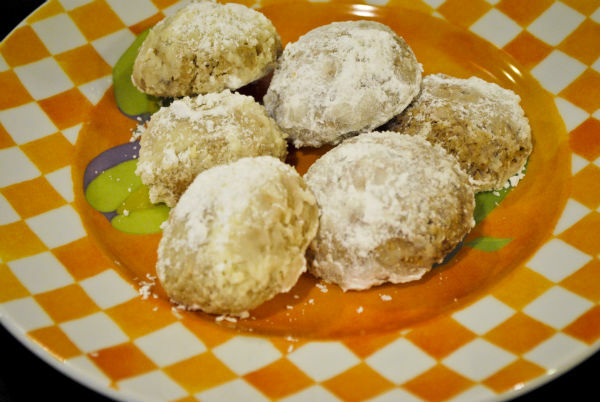 Before serving the Kurabiye, roll them in powdered sugar a second time. Thank you for the wonderful recipes and pictures of delicious foods that I remember from childhood. My grandmother, aunts and their friends used many similar recipes to make our favorite foods, especially for weddings and celebrations. I’ve made several myself, for family parties and they are very labor-intensive, but well-worth the time. Special food and treats for special people! OMGosh, I love these. I know they are a little different, but a dear friend of mine bakes and sends me a batch of russian tea cakes (for xmas/hanukah) every year, which I immediately g0bble up before any of the other goodies in the tin. I will share this receipe with her. She was a pastry chef in a past life. I know she will find this culinary treasure with deep history of great interest.